I’ve been working with the executive group and teams from one of America’s leading finance services trading firms. The company has a proud history of disrupting its industry by offering innovative products and services that have shaken the finance system and caught many of its competitors off guard. From humble beginnings 20 years ago it has grown to become a global powerhouse. Yet today, this industry disruptor of the past is concerned about its own disruption of tomorrow, and about markets eroding far faster than they—or anyone—anticipated. New upstarts like Robinhood, Coinbase, Betterment, and Revolut are starting to apply the same tactics this firm once used to usurp the financial giants of the day. As they eat away at market share, the hunger game is one of who will thrive and who will not survive. One of the strategies we have deployed is to create an innovation portfolio of outcome-based bets for future products, services, and improvements for the company’s business. Along with the CEO, the executive group, and the team, we designed a system to enable people to rapidly raise new ideas for innovation. These are reviewed monthly with the leadership team, who then make small investments to discover the potential for future growth and impact for the organization. In short, the company has created its own Shark Tank series and a deep well of willing participants who finally get the idea they’ve always wanted to run, funded and executed with the support and sponsorship of the executive team to accelerate it. The CEO kicked off the initiative by recognizing that the company needed to start thinking and acting differently. He highlighted that to succeed in the future, he, his leadership team, and the participants would need to unlearn much of their outdated thinking and behaviors. They would have to let go of many of the methods that had made them successful in the past, but now limit their future success. The company would need to relearn new behaviors, methods, and mindsets to achieve the breakthroughs it sought in order to build a better future for its business. A strong statement of intent, but only meaningful if it resulted in real change. The problem with transformation is never a lack of ideas; it’s a lack of a change in behavior. This executive group realized that if they wanted to have a breakthrough in leadership mindset and business results, they had to behave differently—not just their teams—and they had to commit to this new behavior for a period of time. The same old strategies deliver the same old results. These leaders realized that unlearning old habits and poor practices takes far more than marginal thinking and action. You’ve got to be willing to get outside your comfort zone and have the courage to work in new and uncertain ways to achieve breakthroughs and extraordinary results. These leaders don’t fear the future; they’re inventing it. As soon as the initiative was launched, ideas started pouring into the CEO’s office—over 200 in the first week alone. 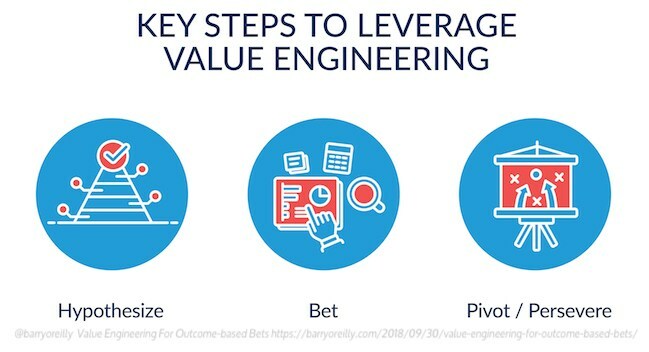 Value Engineering is an evidence-based approach to innovation, product strategy, and development that favors learning through fast and frequent experiments, and using the information you gather to inform investment decisions. It’s a system of developing hypotheses, setting and committing to a disciplined set of outcome-based success criteria, and holding yourself accountable to the results achieved to inform further bets. Our approach at the finance services trading firm was to pick five pitched ideas, invest in them for a month, and learn what worked and what didn’t—while also unlearning the behaviors that were holding the organization in the past. One of the first pitches immediately caught the CEO’s attention. He didn’t just like it, he loved it! To the point where he was willing to write the team a check for $5,000,000 on the spot to start implementing it immediately. The idea was to combine clients’ financial information with their health information, and develop a suite of services to help them make better investment decisions for their future financial needs and lifestyle. The massive potential of the idea piqued the executive group’s interest; access to new customers, leverage of existing assets, and opportunity to converge two major markets for growth and returns. The pitching team was delighted with the feedback and excited by the size of the check, however what happened next was truly amazing. If we want to unlearn and start thinking and acting differently, we need to deliberately practice it. While the easy option would have been to take the $5,000,000 and run, we knew we needed to unlearn the behavior of big bets and big budgets becoming too big to fail. We needed to break through towards our new desired behaviors and system of Value Engineering. Well, how would you react to the idea of combining all of your financial information with all of your health information, then giving it to one provider who would use it to try to sell you services? By testing their hypothesis with real customers, the team quickly discovered that people not only disliked the idea, they hated it. Of the 30 customers they interviewed, only two said that they might be open to it—a 94 percent failure rate. “And how much time and money did it take to come to that conclusion?” the CEO asked. “We spent a few days testing, and about $5,000.” The team held their breath, knowing how excited the CEO had been about the idea and with the fear of their failure to make his favorite idea a success running through their mind. Would he be angry? Would they be fired? Would the CEO send them to the mailroom, never to be seen again? 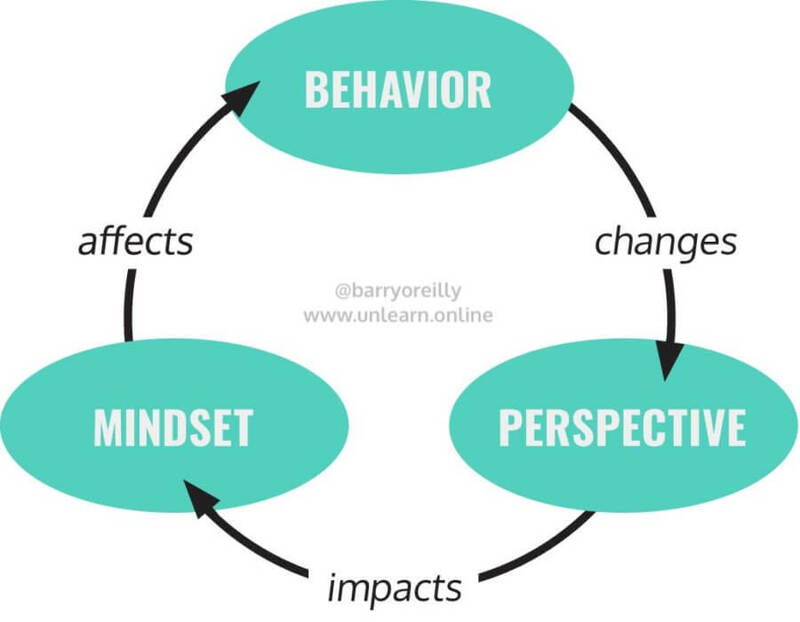 To encourage an outcome-based mindset driven by an experimental and evidence-based approach, leaders must design a safe space for failure to occur. This is accomplished by working in small bets instead of big, multifaceted projects. Small bets create safe-to-fail experiments enabled by faster feedback loops, limited-risk investments, and keeping initiatives in a recoverable state by never being too big to fail. The CEO’s reaction set the mindset and standard of behavior that the organization will need to be successful for the future. He role-modeled a mindset of learning, safety, and experimentation—attributes that will help him and the company progress. His reaction encouraged the team and other participants to become more courageous, get more uncomfortable, and tackle uncertainty to grow. Now, only four months into the initiative, we have tested over one hundred ideas, quickly killing the majority of them but learning a massive amount along the way. We are acting our way to a new culture of experimentation and learning. Experiment velocity has increased by over 2,000 percent since we began. Ideas have formed, failed, reformed, and risen to better results and investment returns. This financial powerhouse is now getting back to the principles and practices that made it great at the start, as it seeks to self-disrupt and scale this success throughout the business. The CEO, executive group, and team couldn’t be happier. This article is republished from Barry O’Reilly with permission. Read the original article.